If you wish, there are many ways to travel back and forth between these two top cities, which include bus, self-driving and flight. Nonetheless, ETS train from Ipoh to KL or from KL to Ipoh is always more favourable compared to the others. Going to Kuala Lumpur from Ipoh by train is preferred for the combination of the cheap, easy and most convenient way of travelling in Malaysia. The ticket price is cheaper than flight and there is no chance you will be stuck in the traffic for hours especially during public holidays. On top of that, you get to enjoy the beauty of small and big towns in Malaysia from the window. The train is air-conditioned and travel faster than buses. You will surely enjoy your train trip in any parts of Malaysia! Starting from February 2017, KTMB has announced new schedule for ETS. There are 3 routes for ETS now; Gemas to Padang Besar, Gemas to Butterworth and KL to Ipoh. ETS from Ipoh to KL are included in all three routes. ETS Silver – 15 stops. Click here to see the stops. ETS Gold – 11 stops. Click here to see the stops. Below is the latest timetable for ETS train from Ipoh to KL via KL Sentral-Ipoh-KL Sentral route, valid from 1st August 2017. 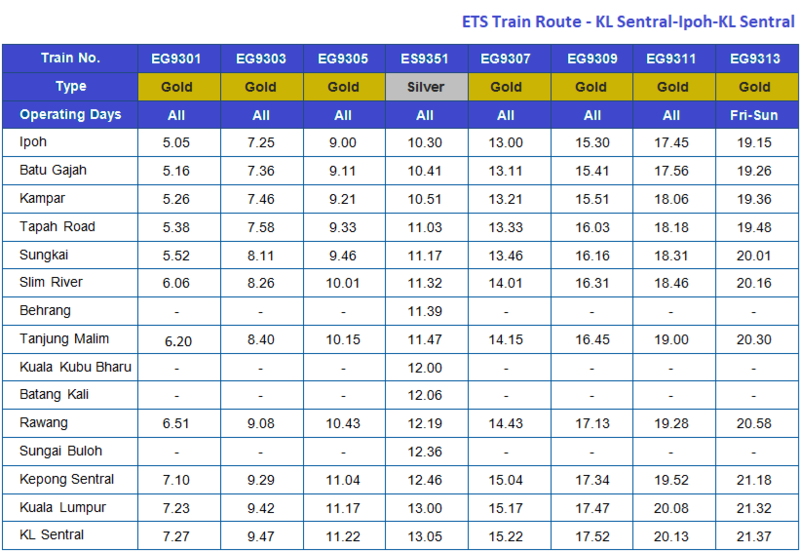 ETS Platinum is only available via Gemas-Butterworth-Gemas and Gemas-Padang Besar-Gemas route. Ipoh Railway Station is one of the historical buildings remaining built during British colonial era back in 1935 and opened for operation in 1917. Until now, the beautiful buildings also known to be the ‘Taj Mahal’ of Ipoh still stand tall and giving benefits to the people. In addition, this building houses the famous Majectic Hotel. This is also the departure point for train from Ipoh to Kuala Lumpur. In Kuala Lumpur, you will arrive in KL Sentral, which is one of the top transportation hubs in Kuala Lumpur. From KL Sentral you can easily travel to other places, as there are many transportation options in KL Sentral such as the LRT, taxi, buses and other KTM train. In KL Sentral, you will find many shops and eateries if you need food or anything to prepare for your next journey. It is also connected to a shopping complex; Nu Sentral, if you feel like walking around before you travel to your next destinations. We advice you to buy your ETS ticket early (one or two days earlier) because train tickets from Ipoh to KL usually are sold out quickly especially on weekends. Alternatively, you can buy your ETS ticket online with BusOnlineTicket.com. Reserve your ticket and get instant confirmation through your email. On top of saving cost to go to the train station to buy the tickets, you can save your precious time from having to queue and wait for your turn at the counter. 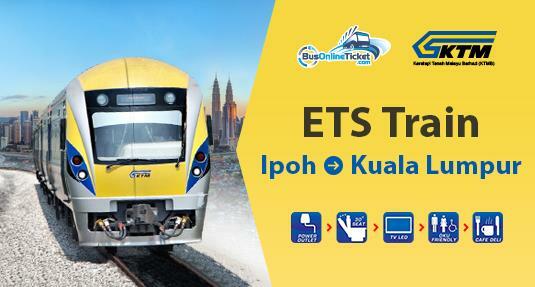 Easily Book Your ETS Online Ticket from Ipoh to KL Now!